Manuel and Mario Stecher are two stand-up paddlers from Kaufbeuren, who have even noticed television in the recent past. We introduce the Stecher Twins. 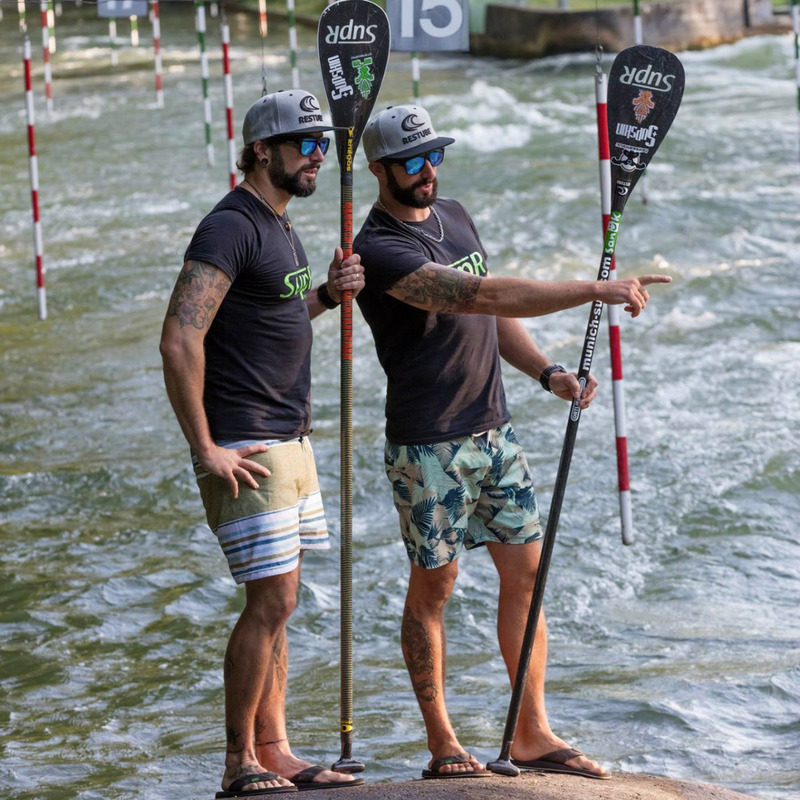 Two SUP riders, Manuel and Mario, the Stecher Twins – the German Stand Up Paddling scene is currently experiencing the rise of two men from the Bavarian town of Kaufbeuren. Mario and Manuel Stecher are identical twins who share a common hobby. Born on 22 May 1983, both have developed a love for water sports. The twins are well-known faces on the Eisbachwelle in Munich and are ambitious kitesurfers and paddlers. Meanwhile Manuel and Mario also belong to the Starboard team. With the SUP they are even in winter, where they make the snowy Bavarian mountains on their boards unsafe. 2015 was such a successful year for the Steiner Twins, that even television was attracted to them. The Bavarian Radio reported on the twins, further TV appearances have already been agreed. Paddling, kiting, surfing – the Stecher Twins are versatile. Together with Arnd Dünziger and Andy Dessler, they managed the first round of the Lake Garda, which is a great challenge for SUP athletes due to the local wind. The four riders nevertheless packed the tour within two days and collected at the same time 2000 euros for the rescue of the last Adriatic dolphins. Most recently, they made the round of the Lac Léman (Lake Geneva), its sign the largest lake in Switzerland and the second largest lake in Central Europe. They spent almost 200 kilometers on the perhaps hottest weekend in July. And Mario Stecher has already left the lake. He is, by the way, the first German champion in Wildwater SUP. In Lofer (Austria) the 32-year-old rider won gold in the official competition of the German Stand Up Paddle Association on the Saalach.